Works online: 14 Total prizes: No prizes won. Issa’s birth place in Cote d’Ivoire in West Africa has ancient animist roots which predate the arrival of Islam from across the Sahara and Christianity during the colonial era. 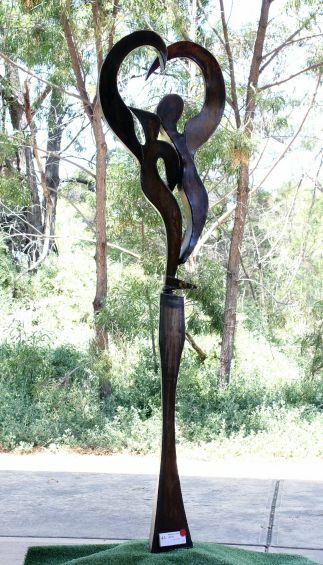 The spiritual connection to the natural world are passed on through intergenerational stories, poems and music and are expressed in myriad sculptural forms in bronze and wood and are often incorporated in masks as well as architectural pillars, chairs and other functional objects. 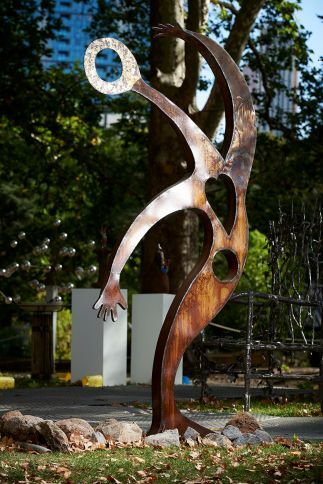 Unlike the static, emotionless, totemic figures seen in some other parts of the world, these are often evocative of profound emotions across the spectrum of grief, anger and joy. 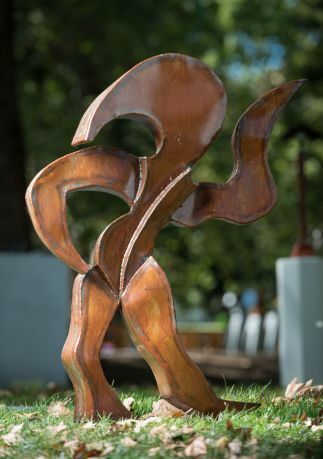 In his contemporary sculptural expression Issa draws on his West African cultural and artistic heritage as well as his life experience to create large figurative sculptures which evoke strong and positive feelings. The integration of the ‘old/ancient’ with the ‘new/now’ is subconscious but clearly present. 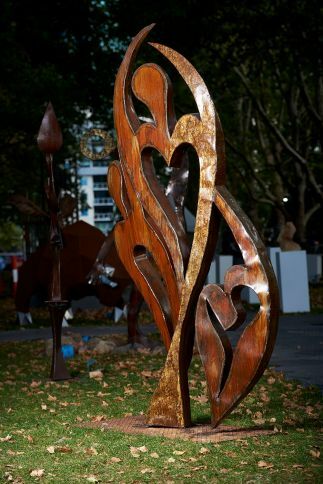 The masculine media of mild steel is transformed to the feminine by Issa’s flowing forms including soft dynamic curves. 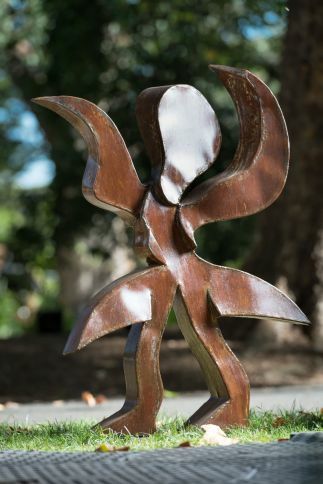 While each piece is deeply personal embodying a part of Issa’s essence, Issa hopes that each sculpture can speak to its audience without accompanying narrative or explanation. 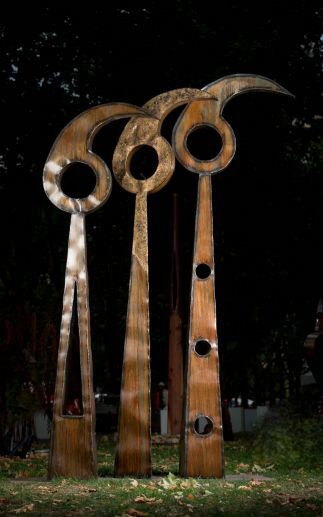 Over 20+ years, Issa has designed and created original, predominantly hand-crafted art works in mild steel with occasional integration of wood, glass and other media. Much of his work is celebratory imbued with Issa’s innate optimism. Issa draws on his West African cultural, spiritual and artistic heritage and is inspired by the natural beauty in the world around us and the courage of many individuals and communities. Having lived through child labour, poverty, war and degradation of the natural environment he is also fundamentally committed to social justice and protection of the natural world which is also expressed in his work. At 40, Issa’s incredible smile and generosity of spirit belie his difficult start in life. As a child of a broken family, Issa had no education and became homeless as an adolescent. He found a job as an apprentice to repair refrigerators and slept under his work bench. 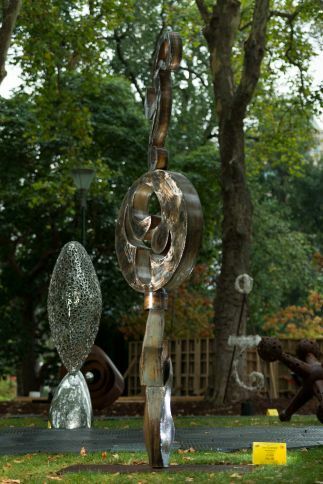 When he was 14 his life was changed forever when he met artist and sculptor Michelle. Michelle had grown up in France but had fallen in love with Cote d’Ivoire and had lived there for over 40 years with her Ivorian husband. 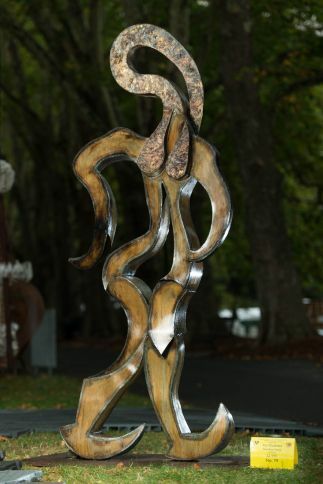 She became Issa’s mentor and shared with him her passion and skills for sculpture and creative arts. Issa became more than an assistant and developed his own unique style working with his favourite metal media.Sadly, Michelle passed away suddenly when Issa was just 21. This left Issa distraught because she had become a source of constant artistic and spiritual inspiration. 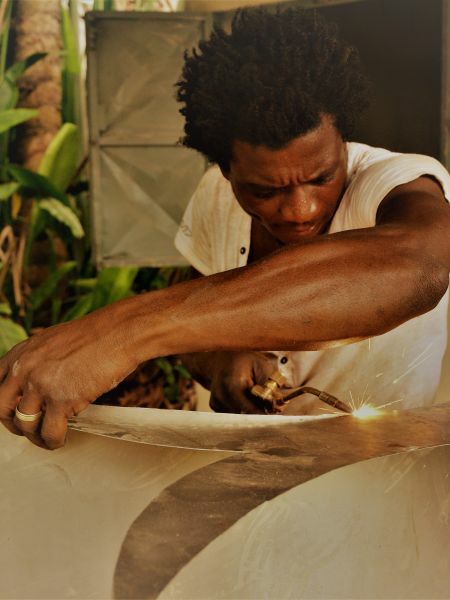 After Michelle died her family and friends encouraged Issa not to give up but to be inspired by Michelle and pursue his artistic endeavours with use of her workshop. With their support, Issa’s first solo exhibition was held and was a success. 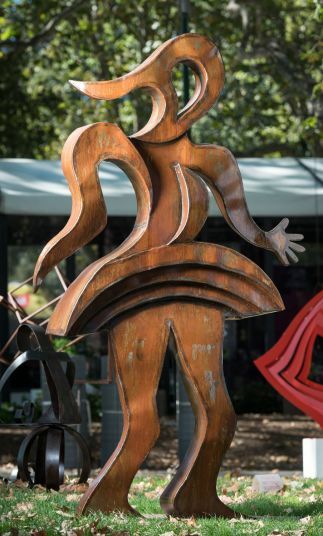 Since then, he exhibited every year in Cote d’Ivoire and established himself as a successful artist with many commissions. Issa believes Michelle’s spirit lives on in his creations. In 2006 he met an Australian doctor working in Cote d’Ivoire to combat the HIV/AIDS epidemic and life took another twist; with their partnership taking him first to Cape Town, South Africa then to a historic church in Franklinford near Daylesford. Beautiful daughters Angela and Sophie have joined Issa and Monica’s journey. 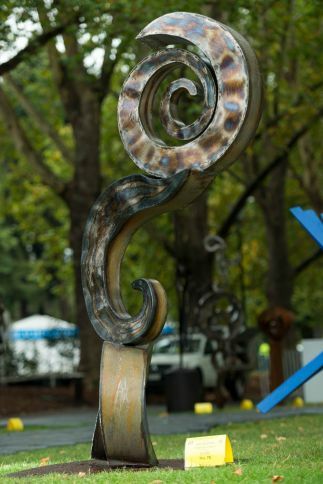 They have established their home base and Issa’s studio and sculpture garden at their historic Franklinford church property near Daylesford in Victoria, Australia. In 2014, Monica’s work has taken them back to Africa where they are based in Kampala, Uganda with Issa moving between Australia, Cote d’Ivoire and Uganda. From Feb 2017 he has been principally based in his central highlands histotric converted church and studio between Daylesford and Castlemaine to work, exhibit and network with fellow artists.Issa welcomes commissions!